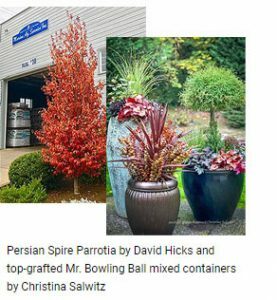 Here is a link to UpShoot’s Great Garden Stories flyer which features story starting ideas revolving around Nativars, Scent-Sational Selections, Flower Power, Fine Foliage and Garden Staples including Persian Spire™ Parrotia, Old Fashioned Cotinus and a Mr. Bowling Ball® to name just a few. 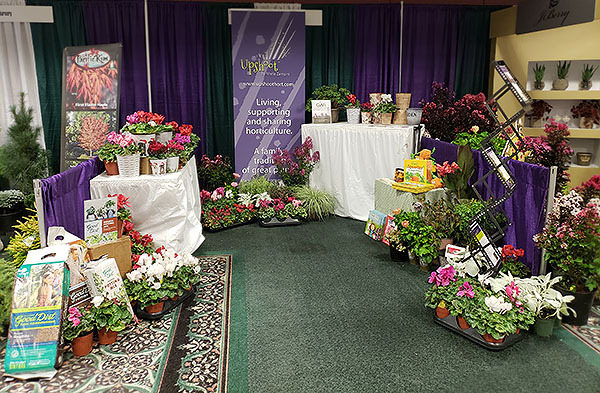 Our booth included a special appearance by Kathy McKay of Schoneveld Breeding featuring their cyclamen including Mammoth Red, the reddest cyclamen on the market. She discussed how they breed for the amount of flowers per plant and how to utilize cyclamen both indoors and outdoors in mixed containers. InstantHedge launched their borders in a flash this past spring but their boxwood version debuted at the IGC and GWA show. Spookley the Square Pumpkin and other edutainment books and activity packets from Evergreen Creations were an attention-getter in the booth. 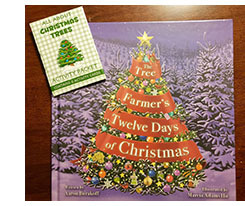 In fact, Evergreen Creations has just launched their new The Tree Farmer’s Twelve Days of Christmas book and Christmas Tree activity packet in time for the holidays. We also had displays featuring daVinci grow and drop-in pots which are made in the USA. 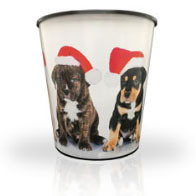 They have several holiday patterns and debuted new patterns for 2019. Some of my favorite plants for holiday decorating include mixed combo of poinsettias and Senecio Angel Wings from Concept Plants, Santa’s Delight® Variegated Holly and red fruited crabapples like Weeping Candied Apple™. UpShoot is pleased to produce regular enewsletters for several green industry greats. If you’re not getting the following enews you’re missing out on some timely gardening content and special offers for yourself and your co-horts. Corona Tools – Published monthly, this enews offers special discounts on two different gardening tools! J. Berry – There is a J. Berry enews which is industry focused, a Hollywood Hibiscus enews for consumer based fans of these tropical divas and keep your eyes peeled as coming in 2019 the Black Diamond Crapemyrtles will also have an enews for home gardeners. Sign up individually for one or all! Must Have Perennials – You’re probably familiar with the most shared flower on social media, Rozanne Geranium. Rozanne® and Friends is the consumer facing brand of perennials for Aris Horticulture and Must Have Perennials® is their trade brand. You may have known it previously as Blooms of Bressingham which was discontinued a couple years ago in favor of these two new brand names. If you’re looking to learn more about perennials, you may be interested to know that Dr. Allan Armitage actually teaches two online classes through the University of Georgia: Herbaceous Perennials for Sun and for Shade. This is a great way to learn from this industry icon in the comfort of your own home at your convenience and at a reasonable rate! The winter trade shows will be here before we know it. You’ll find Katie Elzer-Peters and I at the MANTS Show in Baltimore in the HIP Labels booth 1302-1304 and walking the show floor. After that I’ll be at the NCNLA Green & Growin’ Show in Greensboro, NC in the UpShoot booth 641. In the meantime, may I wish you and yours a blessed holiday season. May it be filled with lots of laughter and love with cherished family and friends. I’ll be spending time with my mom baking our traditional Hungarian nut rolls and balash plus buckeyes and chocolate covered pretzels. I can’t wait!